A key factor in the quality of student language use in second language education is the experience and overall fluency of the educator. This is a particularly important consideration as second language learners become teachers, or as target language educators adapt to the structures, standards, and impositions of dominant language institutions and communicative practices. Special challenge is presented by the need to develop new language for new concepts in ways that are culturally and linguistically authentic. This presentation will focus on the fluency essential for the successful teaching and transmission of the target language, with Maori as the principal exemplar. Tīmoti is a descendant of the Ngāi Tūhoe and Ngāti Kahungunu tribes. He is a scholar who is nationally and internationally recognized for his knowledge of the Māori language. 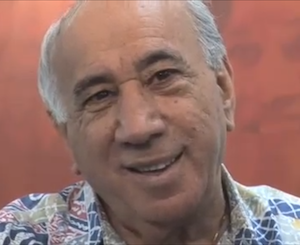 Tīmoti is also a prolific composer and Māori performing arts expert. In 1970, he was appointed as the first Professor of Māori Studies at the University of Waikato. In 1987 he became the first Māori Language Commissioner at Te Taura Whiri i te Reo Māori. He continued in the role until 1999. From 2003, Tīmoti was the Head of Te Kōhanga Reo National Trust. He has also been a vital part of the Te Wānanga o Aotearoa. Tīmoti has been involved in numerous Māori performing arts competitions as a tutor, a composer, a judge and an organizer. He was the head of the national Māori performing arts competition for many years. Tīmoti has received two Honorary Doctorates; one from Victoria University of Wellington and the other from The University of Waikato.